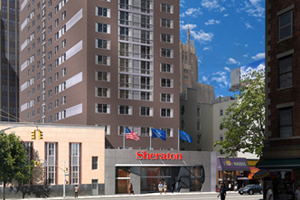 Starwood Hotels and Resorts has opened the Sheraton Tribeca in New York's Manhattan district. The opening is part of Starwood’s drive to grow its New York portfolio by 50% this year and follows the opening of Sheraton Brooklyn in Mayl. Sheraton Hotels senior vice president Hoyt Harper said: "We are delighted to welcome travellers to our second new Sheraton in New York City in just five months, as we actively grow our presence in this global gateway city and key financial centre." The 369-room hotel has two meeting spaces of 53sqm and 82 sqm.